Zimpy.com - Create your own clothing with custom text and designs! Didn't see anything you liked on Zimpy.com? Looking to create a custom t-shirt using your own text or designs? Become a CafePress shopkpper! Sends you a monthly check for your earnings on sales! 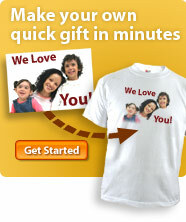 We've partnered with SpreadShirt.com to enable our customers to get exactly what they want, if we don't have it. So, if you want your own design or slogan on a shirt or sweatshirt, you've come to the right place.